Also, please visit our Tank Pumping Schedule page to get a guideline of when you should have your tank pumped. This is a small, “Mom & Pop” shop that really delivers great service at a great price; literally beat the competition by 27%!!! Friendly, on-time and service oriented. I would definitely recommend this Veteran owned business to anyone. The best! Great customer service and great price! They went above and beyond to make sure it was the very best it could be. HIGHLY RECOMMENDED!! 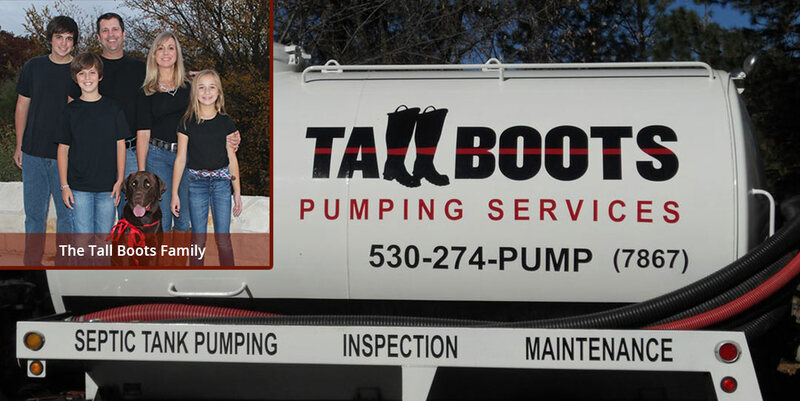 We cannot say enough good stuff about Tall Boots Septic. Zack, the owner, gave us a lot of telephone advice since we needed to uncover the septic tank, then came out within 30 minutes of our phone call when we were ready for him. Offered us a discount on the already super low price. Honest, friendly and helpful. Found him on Yelp and so true, he’s great.